We have invited Carol Borchardt from A Cookbook Obsession to share another of her delicious and healthful recipes. This recipe for Cucumber, Tomato and Red Onion Salad is a great choice for anyone seeking new Mediterranean Diet recipes. This salad is bright and flavorful, perfect to grace the table with any Mediterranean meal. We also recommend this salad for a satisfying lunch. 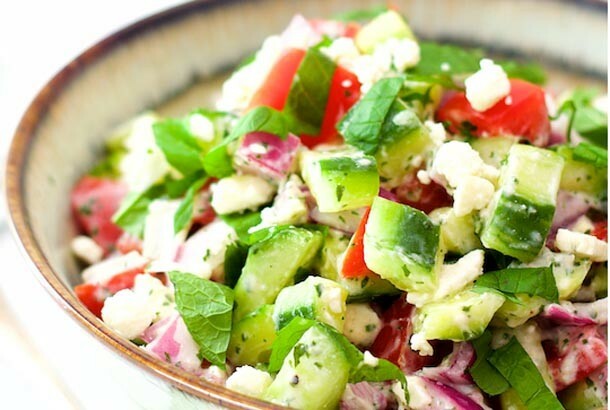 This recipe is very similar to a crunchy traditional Greek Salad. We enjoy the addition of plentiful fresh mint that adds extra sparkle to this recipe. You’ll also be pleased to know that this is a truly health-packed dish, filled with superfoods and other healthy ingredients. Here is Carol Borchardt’s Cookbook Obsession page. Find Carol cooking up a great collection of creative recipes! And, here is her Facebook page. Stop by and give her a like. You’ll be treated to delicious recipes on the regular. TO MAKE AHEAD: Chop vegetables and make dressing up to an hour ahead; refrigerate. Just before serving, combine and serve immediately.